Why is a rupture extremely dangerous? An aneurysm is a blood-filled dilation of a blood vessel caused by a weakening of the vessel’s wall. Aneurysms typically develop because of the general wear and tear of blood pressure on the arteries’ walls, called hemodynamic forces. 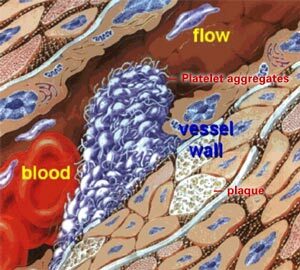 A weak spot in the artery wall bulges out, giving way to the pressure of the blood flow, forming a sac. For this reason, areas of artery or vessel wall which are submitted to higher blood pressures are more susceptible to aneurysm development, such as the branching points of arteries, called bifurcations. In the same way that a balloon stretches, the aneurysm sac balloons out from the vessel wall usually slowly, progressively becoming weaker. 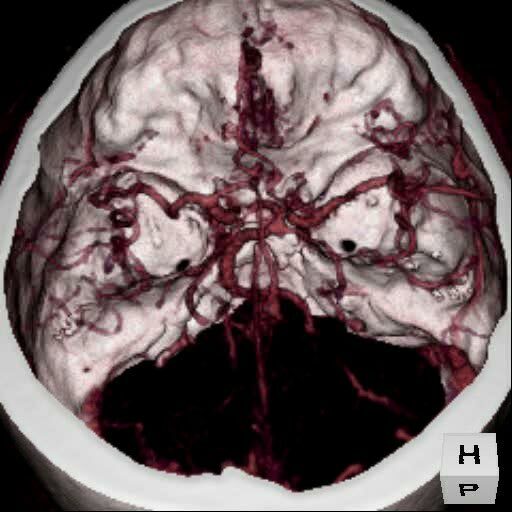 3-D Volumetric reconstruction of an anterior communicating artery aneurysm. - Click image for a larger view. QuickTime (1.33 MB) - Click here to download latest QuickTime player. One of the biggest dangers with an aneurysm is when some of the blood flowing through the artery diverts into the aneurysm sac, causing an eddy-like effect. The diverted blood hits the opposing wall of the aneurysm sac at a high pressure. Eventually this pressure can cause the aneurysm sac to rupture. Rupture then leads to bleeding within the head (hemorrhaging) which causes brain tissue compression and damage often resulting in a severe headache, and other symptoms such as, stiff neck, weakness, confusion, or even loss of consciousness. Aneurysm ruptures result in bleeding within the subarachnoid space, that is, the space between the skull and the brain; this is called a subarachnoid hemorrhage (SAH). X-ray reconstruction of top of head/brain - Click image for a larger view. QuickTime (691 KB) - Click here to download latest QuickTime player. Approximately 2 million Americans have silent unruptured aneurysms. Most of these people do not know they have an aneurysm and have no symptoms (estimates vary between 1.5-6% of the U.S. population). The overall annual rupture rate is approximately 12/100,000, which means that each year 240 of the 2 million with unruptured aneurysms will experience a rupture. However, the risk of rupture of a particular aneurysm can be much higher and varies from 1/1000 to over 100/1000 depending on the characteristics of the aneurysm. There are 30,000 new aneurysm ruptures or "SAH" cases reported in the US annually and about half of these will lead to death. Of those surviving, only one third will recover without disabilities. What increases your risk for an aneurysm rupture (SAH)? If you have one aneurysm, there is a 15 to 20 percent chance that you have at least one or more additional aneurysms. It is unknown whether the presence of multiple aneurysms affects their rupture rates. Further research is needed in this area. When an aneurysm ruptures, it leads to bleeding within the head called hemorrhaging. This is a type of stroke. The term ‘stroke’ refers to the sudden onset of neurological symptoms due to a problem with the brain circulation. There are two ways a stroke can occur: ischemic or hemorrhagic. Ischemic stroke refers to the blockage of an artery, usually by a blood clot (see thrombus), which may be due to the narrowing of arteries caused by arterial disease (see atherosclerosis). 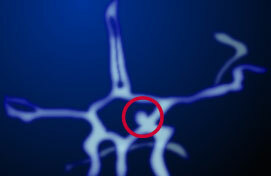 This interruption of the blood supply causes a lack of oxygen in the brain tissue the artery was feeding. This damaged brain tissue is referred to as an ‘infarct’. Thrombus Formation - Click image for a larger view. The type of stroke caused by a ruptured aneurysm is hemorrhagic, where a burst blood vessel or artery leads to bleeding. This bleeding causes compression and damage to the brain tissue. Aneurysm rupture almost always leads to bleeding within the subarachnoid space, between the skull and the brain. Hence, aneurysm ruptures are referred to as subarachnoid hemorrhages (SAH). Aneurysm ruptures are not the only cause of SAH; other causes include an arteriovenous malformation (AVM) or head trauma. A patient suffering the onset of subarachnoid hemorrhage should be rushed to a medical facility as quickly as possible, as early treatment greatly increases the probability of a better outcome. The International Study of Unruptured Intracranial Aneurysms (New England Journal of Medicine, 339:1725-1733, 1998) found that for patients with no prior history of SAH, the rupture rate per year was 0.05% for patients with small aneurysms (less than 5mm diameter) and 0.5% per year for patients with large aneurysms (greater than 10mm diameter) or for patients with a past incident of SAH. The incidence of SAH in the population is 6 to 8 per 100,000 people overall, peaking in the sixth decade accounting for a quarter of cerebrovascular deaths (Wardlaw and White, The detection and management of unruptured intracranial aneurysms. Brain 123:205-221, 2000). 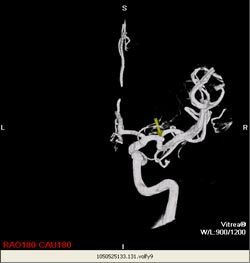 3-D CT scan reconstruction of small aneurysm at bifurcation of arteriole (arrow designates aneurysm) - Click image for a larger view. QuickTime (484 KB) - Click here to download latest QuickTime player. 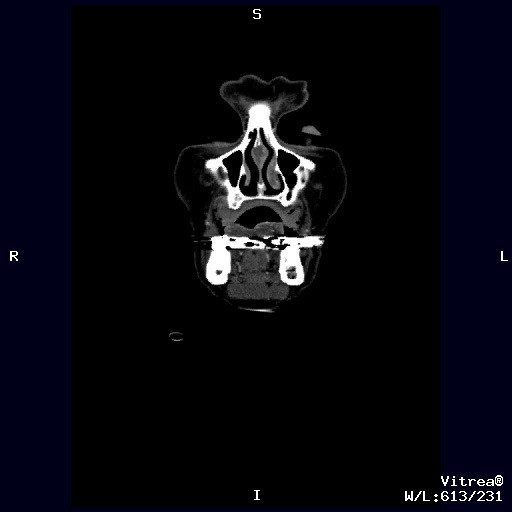 3-D CT reconstruction using Vitrea software of giant aneurysm in the posterior Communicating artery - Click image for a larger view. QuickTime (1.55 MB) - Click here to download latest QuickTime player. However, once an aneurysm has already bled, there is a very high re-bleeding rate. Treatment is recommended as soon as possible in this case. Blood ‘thinners’, including aspirin, Warfarin, and other medications or prescriptions drugs. Stimulants such as diet pills like ephedrine and amphetamines as well as recreational drugs like cocaine can cause aneurysms to rupture, as well. Although the incidence of an aneurysm rupture is relatively low, a subarachnoid hemorrhage is associated with a disastrously high fatality or substantial mental impairment rate as a result of its initial bleed or complications thereafter. Percentage of possible outcomes after initial bleeding, according to the American Stroke Association. More rupture statistics can be found in the Brain Aneurysm Treatment section of this website. There are several possible complications associated with a rupture. Here are a few key dangers. Hydrocephalus could result from fluid buildup as blood collects around the base of the brain. This causes an enlargement of the spaces within the brain that produce cerebrospinal fluid. This is treated often by inserting a tube into the ventricles (fluid-filled space of the brain) called a ventriculostomy tube, which drains into a bag at the patient’s side. Vasospasm is also a possible complication associated with hemorrhaging in the brain. The onset of vasospasm can be anytime between 3 to 14 days after the initial hemorrhage. The blood released into the fluid-filled spaces at the base of the brain can chemically irritate the other vessels located there, causing them to constrict in response. This constricting could lead to a stroke or blockage of a vessel by plaque or some other debris causing it to rupture in a second hemorrhagic event. 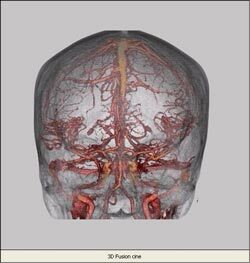 This constriction of normal blood vessels is also likely to interrupt blood flow to healthy brain tissue, leading to even more brain damage. The treatment of vasospasm involves a host of different medicines, including those that increase blood pressure. This treatment option of elevating blood pressure is usually administered only after the ruptured aneurysm has been treated first. Another option is to directly manipulate the vessels, using a catheter to open the vessel wall with a stent , medication, or both. Vasospasm and the threat of spastic vessels fade over several days. The sooner a ruptured aneurysm is treated, the lesser the chance of vasospasm setting in. Once blood enters the brain and the surrounding space, there is also direct damage to the brain tissue and functions. The amount of damage is proportional to the amount of blood leaked. This damage is caused by the swelling, compression and irritation of the brain tissue by the blood. Getting treatment immediately is optimal to avoid additional complications. Other complications and delayed effects of a hemorrhage include fever, headaches, seizures, and strokes, all of which can be treated with various medicines, or procedures. The statistics on recovery of complete neurological functions vary depending on the treatment pursued. In 50% of hemorrhage cases, the bleeding results in death. Although a hemorrhage is a very serious occurrence, the techniques for handling them have greatly improved and the proportion of patients who survive is increasing. Although treatment of the aneurysm will not reverse the damage already inflicted on the brain from a bleed, stopping the bleeding will prevent further damage. Once the patient has been treated, the recovery of any affected brain functions can occur with rehabilitation therapy. 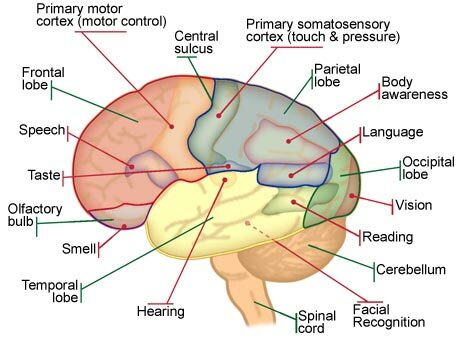 Diagram of the lobes of the brain, with their associated functions. The damage a hemorrhage may inflict on mental integrity varies based on location. There are many studies presenting different statistics as to the recovery rates based on whether or not the patient was treated and what type of treatment was used. This site will present several of the more standard studies. If the patient is not near a hospital, and the rupture is left untreated, there is about a 40% chance of the bleeding slowing and eventually stopping altogether. The aneurysm would heal by blood clotting action, and the patient would survive. However, in 30% of cases left untreated where the patient survives, the bleeding results in some amount of brain damage ranging from morbidity (severe incapacitation, usually paralysis or coma) to mild neurological deficits, such as speech defects. Like people. no two aneurysms are the same. They vary in size, shape and location. Thus, the appropriate course of treatment is dependent on the particular structure and location of the aneurysm. It is important to familiarize yourself with the indices used to measure aneurysms, such as the neck-to-dome ratio. The size of an aneurysm is measured by its diameter in millimeters. There are two main types of aneurysms: saccular and fusiform. The more common of the two, saccular or "berry" aneurysms, bulge out of one side of the artery wall. Saccular aneurysms can connect to the artery either with a distinct, well-defined neck or with a wider, broad-based opening to the artery. Fusiform aneurysms are a swelling of both sides of an artery wall and have no defined neck or stem. The shape of an aneurysm is a major factor in the choice of treatment. 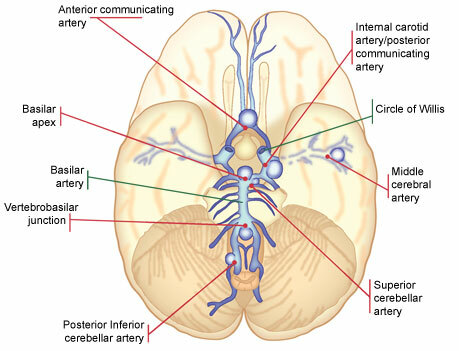 Aneurysms usually occur along the major arteries deep within the brain structures. They occur, as mentioned above, in areas of relatively higher blood pressure such as bifurcations, where one artery splits into two. They can occur either in the front part of the brain (anterior circulation) or back part of the brain (posterior circulation). Much of the risk of rupture and risks of treatments depends on the location of the aneurysm. 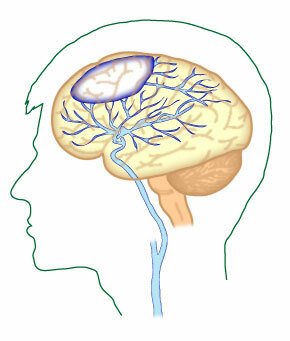 The brain has several main arteries as well as the network of smaller vessels (small arteries are called arterioles) branching out from those, any of which can develop an aneurysm. These arteries are responsible for delivering blood from the heart to the tissues of the brain. 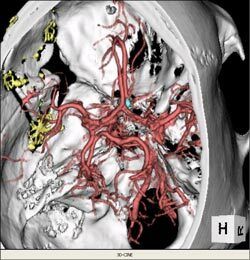 3-D CT reconstruction of intracranial arterial and venous anatomy. - Click image for a larger view. The blood is then collected by veins and delivered back to the heart. However, because the arteries are the vessels receiving blood pumped straight from the heart (via the carotid artery), they experience much higher pressure than the veins. They are therefore more susceptible to aneurysms. 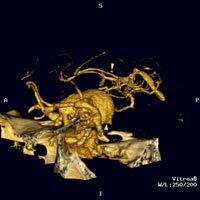 3-D reconstruction CT scan with aneurysm located in the paraopthalmic area. - Click image for a larger view. QuickTime (493 KB) - Click here to download latest QuickTime player. 75% of SAH cases are the result of a ruptured saccular aneurysm in the "circle of Willis" or a branch artery (Sengupta and McAllister, 1986 cited in Wardlaw and White, 2000). *New England Journal of Medicine 339 11725-1733, 1998. Patients with a history of subarachnoid hemorrhage (bleeding in the brain resulting from among other things a ruptured aneurysm) have higher probabilities for another rupture. However, for people with a previously ruptured aneurysm, size is not a factor in re-rupture. The only clear predictor of future rupture for them is location in the basilar tip, with has a higher chance for rebleed. With aneurysms 10 mm or smaller, patients with a history of SAH have a 0.5% rupture rate, 11 times higher than that of patients with no history. However, patients with a history have a lower chance for rupture for aneurysms 10mm or larger than do patients with no history. Aneurysms are deceiving. Symptoms are rare and usually so slight as to be undetectable. Unfortunately, this gives the patient little warning to address the danger of a hemorrhage. Additionally, there is typically no long period of sickness associated with the disease. Unfortunately, there are few initial symptoms of unruptured aneurysms. In particular, most small aneurysms have none. In fact, most aneurysms are found by accident during routine check-ups or an investigation of another problem. Aneurysms that rupture can show warning signs. However, only about 40% of all major ruptures are preceded by any combination of the following symptoms.